1996. Hardcover wih Dust Jacket. New. At Gallipoli in 1915 the British Admiralty gambled on outflanking Germany's Turkish allies and lost. Thousands of soldiers paid with their lives, as depicted in the famous Australian film. For the remainder of 1915 the Commonwealth troops held on to the rocky slopes of the Gallipoli peninsula, under constant fire from the Turks and their German advisors. 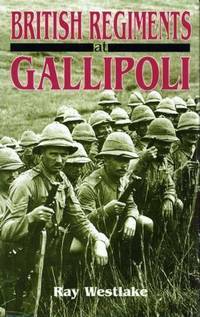 The Turkish government has recently granted easier access to the Gallipoli battlefield, sparking renewed interest in the campaign.In addition to Australian troops, many British units also served, making some of the most costly early amphibious landings. World War I authority Ray Westlake provides full details of the Royal Dublin Fusiliers, Lancashire Fusiliers, and all other British units at Gallipoli. Battles and engagements, along with movements in and out of the line, are dealt with at battalion level, rather than on a larger and less detailed divisional scale. More than 2,000 volumes of war diaries, regimental histories and personal reminiscences were consulted to produce this definitive work.